The Company reported net income from continuing operations attributable to common stockholders of $941 million ($3.43 per basic and diluted share) on a GAAP basis for 2015, including $1.5 billion of non-cash gains on unsettled hedges ($954 million net of tax), $98 million of non-cash equity-based compensation expense ($61 million net of tax), $104 million of impairments of unproved properties ($65 million net of tax), and $39 millionof contract termination and rig stacking expense ($24 million net of tax). Excluding these items, adjusted net income from continuing operations attributable to common stockholders was $152 million ($0.56 per basic and diluted share) for 2015, representing a 52% decrease over the prior year. Adjusted EBITDAX of $1.2 billion for 2015 was 5% higher than the prior year primarily due to a 48% increase in production, which was partially offset by a 20% decrease in the average per Mcfe price received after the impact of cash settled derivatives, net of the related increases in cash operating and general and administrative expenses. EBITDAX margin for 2015 was $2.24 per Mcfe, representing a 29% decrease from the prior year due to lower commodity prices. For 2015, cash flow from operations before changes in working capital was in line with the prior year at $976 million. For a description of Adjusted EBITDAX and EBITDAX margin, cash flow from operations before changes in working capital and adjusted net income from continuing operations attributable to common stockholders and reconciliations to their nearest comparable GAAP measures, please read "Non-GAAP Financial Measures." Stone had fourth quarter 2015 adjusted net income of $2.1 million, or $0.04 per share, before pre-tax impairment charges of $351.1 million. Full year 2015 adjusted net loss was $28.6 million, or $0.52 per share, before pre-tax impairment charges of $1,362.4 million. After impairment charges, the net loss was $318.7 million for the fourth quarter of 2015, or $5.76 per share, and $1,090.9 million for the full year 2015, or $19.75per share. The 2015 net loss compares with the 2014 net loss of $189.5 million, or $3.60 per share. The fourth quarter 2015 net loss compares with the fourth quarter 2014 net loss of $190.5 million, or $3.47 per share. Please see "Non-GAAP Financial Measures" and the accompanying financial statements for reconciliations of adjusted net income or loss, a non-GAAP financial measure, to net loss. Discretionary cash flow for the fourth quarter of 2015 totaled $114.6 million, compared to $90.1 million for the fourth quarter of 2014. Discretionary cash flow for 2015 totaled $351.9 million, compared to $437.8 million for 2014. Please see "Non-GAAP Financial Measures" and the accompanying financial statements for reconciliations of discretionary cash flow, a non-GAAP financial measure, to net cash flow provided by operating activities. Net daily production volumes for the fourth quarter of 2015 averaged 24 MBoe (145 MMcfe) per day, compared with net daily production of 42 MBoe (255 MMcfe) per day in the fourth quarter of 2014. Net daily production volumes for 2015 averaged 40 thousand barrels of oil equivalent (MBoe) per day (238 million cubic feet of gas equivalent (MMcfe) per day), compared with net daily production of 43 MBoe (256 MMcfe) per day in 2014. The decrease in fourth quarter and full year 2015 volumes was primarily due to the shut-in of approximately 100 MMcfe per day at the Mary field. The production mix for 2015 was 41% oil, 17% natural gas liquids (NGLs) and 42% natural gas, while the production mix for 2014 was 36% oil, 14% NGLs and 50% natural gas. Excluding potential production from the currently shut-in Mary field (approximately 100 MMcfe per day), average daily production for the first quarter of 2016 is expected to be 32-33 MBoe (192-198 MMcfe) per day. Excluding potential production from the Mary field, production guidance for the full year 2016 is 31-33 MBoe (186-198 MMcfe) with approximately 55% projected as oil, 9% projected as natural gas liquids and 36% projected as natural gas. Please see "2016 Guidance." For 2015, Southwestern reported adjusted net income attributable to common stock, which includes a $13 million impact from a theoretical income allocation to preferred stock, of $71 million, or $0.19 per diluted share (reconciled below), when excluding a non-cash ceiling test impairment of natural gas and oil properties of $7.0 billion ($4.3 billion net of taxes) and certain other items typically excluded by the investment community in published estimates, which in aggregate decreased net income by $4.7 billion, or $12.47 per share (diluted). Including these items, the net loss attributable to common stock for 2015 was $4.7 billion, or $12.25 per diluted share. For 2014, Southwestern reported adjusted net income attributable to common stock of $801 million, or $2.27 per diluted share (reconciled below), when excluding a $131 million ($80 million net of taxes) gain on derivative contracts that have not been settled, discrete income tax adjustments totaling $46 million and $5 million ($3 million net of taxes) of certain transaction costs associated with the West Virginiaand southwest Pennsylvania acquisition closed in the fourth quarter of 2014. Including these items, net income for 2014 was $924 million, or $2.62 per diluted share. Net cash provided by operating activities before changes in operating assets and liabilities (reconciled below) was $1.5 billion for 2015, compared to $2.3 billion in 2014. On a GAAP basis, net cash provided by operating activities was $1.6 billion for 2015, compared to $2.3 billion for 2014. In the fourth quarter of 2015, the Company drilled its first Utica well, the O. E. Burge located in Marshall County, West Virginia. Despite operational challenges being faced similar to other Utica wells in the area, the Company was able to drill the well to its targeted 8,000 feet of lateral length and stayed in the target interval 100% of the time. The Company is encouraged by the data observed during drilling and will report updates as they occur. State Rep. Andy Thompson, R-Marietta, is calling upon the University of Cincinnati Department of Geology to release its full findings from a study looking into water quality in Carroll and four other counties in eastern Ohio. The study determined that natural gas drilling has had no effect on the quality of water coming from wells, primarily in Carroll County. It looked at water quality in Carroll, Columbiana, Stark, Harrison and Belmont counties from 2012 through 2015. Researchers were trying to determine whether hydraulic fracturing — or fracking — creates dangerous levels of methane in well water. Amy Townsend-Small of the University of Cincinnati presented the findings at the February meeting of Carroll Concerned Citizens in Carrollton. In a press release, Thompson said he is “perplexed” at why the full study has not been released. “It is unacceptable that taxpayers have funded this important groundwater study and the findings are now being kept from the public,” he said. “UC has still not produced a full report of their findings, nor has the university issued a press release of their results. Unfortunately Townsend-Small said her team’s research won’t be publicized further because the study’s funders stopped supporting them because of they didn’t like the findings. No press releases, no research papers, and no data released for the public or other researchers to dig deeper. That’s not just disappointing; it looks to be in violation of the grant the University of Cincinnati used to fund its research. The premise of the research project was to see what effects hydraulic fracturing has on drinking water by testing wells before, during, and after fracturing took place. There is some documentation available from the study, posted by Carroll Concerned Citizens. The global burden of atmospheric methane has been increasing over the past decade but the causes are not well understood. National inventory estimates from the US Environmental Protection Agency (EPA) indicate no significant trend in US anthropogenic methane emissions from 2002 to present. Here we use satellite retrievals and surface observations of atmospheric methane to suggest that US methane emissions have increased by more than 30% over the 2002–2014 period. The trend is largest in the central part of the country but we cannot readily attribute it to any specific source type. This large increase in US methane emissions could account for 30–60% of the global growth of atmospheric methane seen in the past decade. While this new study doesn’t attribute a specific source to the remarkable 30 percent increase in U.S. methane emissions from 2002–2014, many other studies have identified the source of those emissions as leakage of methane from the natural gas production and delivery system. The central problem for the climate is that natural gas is mostly methane (CH4), a super-potent greenhouse gas, which traps 86 times as much heat as CO2 over a 20-year period. That’s why manystudies find that even a very small leakage rate can have a large climate impact — enough to gut the entire benefit of switching from coal-fired power to gas for a long, long time. Indeed, as the following graphic from the report illustrates, there is no correlation between existing U.S. shale plays and areas the researchers found increased methane emissions. In fact, the graphic shows methane emissions are actually greater in many areas with no shale development and/or little to no oil and gas production. Many of the areas highlighted in red to illustrate increased methane emissions in the first graphic – including Illinois, south-central Pennsylvania, northern and southern California, New York state, North Carolina and Nebraska – have no shale development. Other states highlighted in red such as Iowa, Minnesota, Wisconsin, Missouri and Georgia have no oil and gas production at all, yet have seen huge spikes in methane emissions, according to the study. 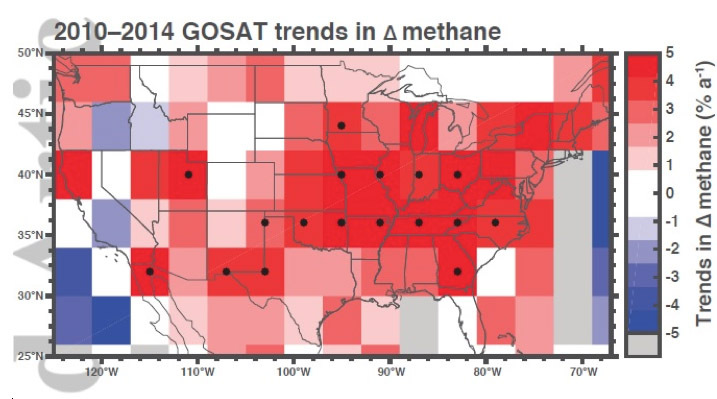 The researchers admit that their method of using satellite retrievals (along with a single surface observation in Oklahoma) to compile their data inhibited them from determining specific sources of methane emissions. 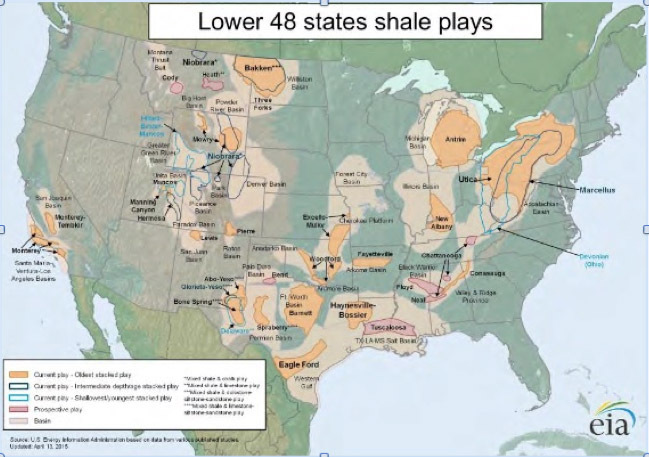 Why Did Utica Shale Gas Production Rise in January? According to Baker Hughes (BHI), the Utica Shale currently has 14 active rigs, down from 16 in December 2015. In comparison, 45 rigs were in operation in the shale in January 2015. From January 2008 to January 2016, additional natural gas production per rig at the Utica Shale rose from ~0.20 MMcf (million cubic feet) per day to 6.5 MMcf per day, or by 32x. In the 12 months to December 2015, the natural gas production addition per rig rose 53%. For the 2015 full year, Chesapeake reported a net loss available to common stockholders of $14.856 billion, or $22.43 per fully diluted share. Items typically excluded by securities analysts in their earnings estimates reduced net income available to common stockholders for the 2015 full year by approximately $14.527 billion. The primary sources of this reduction were quarterly noncash impairments of the carrying value of Chesapeake's oil and natural gas properties largely resulting from significant decreases in the trailing 12-month average first-day-of-the-month oil and natural gas prices used in the company's impairment calculations. Adjusting for these items, 2015 full year adjusted net loss available to common stockholders was $329 million, or $0.20 per fully diluted share, compared to adjusted net income available to common stockholders of $957 million, or $1.49 per fully diluted share, for the 2014 full year. Adjusted ebitda was $2.385 billion for the 2015 full year, compared to $4.945 billion for the 2014 full year. Operating cash flow, which is defined as cash flow provided by operating activities before changes in assets and liabilities, was $2.268 billion for the 2015 full year, compared to $5.146 billion for the 2014 full year. The year-over-year decreases in adjusted ebitda and operating cash flow were primarily the result of lower realized oil, natural gas and natural gas liquid (NGL) prices and lower production volumes, partially offset by higher realized hedging gains and lower production expenses, general and administrative (G&A) expenses and production taxes. Realized hedging gains on the company's oil and gas production resulted in additional revenues of approximately $1.3 billion for the 2015 full year, on a pre-tax basis, compared to realized hedging losses of approximately $375 million for the 2014 full year. Adjusted net income available to common stockholders, operating cash flow, ebitda and adjusted ebitda are non-GAAP financial measures. Reconciliations of these measures to comparable financial measures calculated in accordance with generally accepted accounting principles are provided in this release. Chesapeake's daily production for the 2015 full year averaged 679,200 barrels of oil equivalent (boe), a year-over-year increase of 8%, adjusted for asset sales. Average daily production consisted of approximately 114,000 barrels (bbls) of oil, 2.9 billion cubic feet (bcf) of natural gas and 76,700 bbls of NGL. Adjusted for asset sales, 2015 full year average daily oil production increased 7%, average daily natural gas production increased 7% and average daily NGL production increased 14%. While the $14.5 billion loss is an incredible number, the fact that all but about $300 million of it came from impairments, or writedowns in the value of the company's assets, actually was seen as good news and spurred a small rally in Chesapeake's stock value in the wake of the announcement of these results. Chesapeake's plan for 2016 involves slashing expenses and continuing to sell off assets. While the company is finding a way to weather the storm better than many analysts had predicted, it is clear that it is still in survival mode, like so many other drillers. One part of the plan to cut the budget is to suspend new drilling in both the Utica and the Marcellus shale plays. Financially strapped Chesapeake Energy Corp. is halting new drilling in Ohio’s Utica Shale. The company, Ohio’s No. 1 Utica driller, announced Wednesday that it does not intend to drill new wells in eastern Ohio in 2016 because of financial constraints. That could change if the prices paid for natural gas and liquids increase significantly, the company said. It has released the two drilling rigs that had been at work in Ohio in the fourth quarter 2015 in Carroll and Harrison counties. Chesapeake, also the No. 1 driller in Pennsylvania, said it is halting drilling in the state’s Marcellus Shale; one rig had been at work there in late 2015. Rigs also have been released by Chesapeake in the Powder River Basin in Wyoming and will be dropped in the Eagle Ford Shale in Texas by June. Private equity-backed Haymaker Resources LP has agreed to pay Chesapeake Energy Corp. $128 million for a bundle of mineral and royalty interests in 24 states and 324 counties. The Haymaker Minerals & Royalties LLC unit, based in Houston, secured interests in more than 8,500 wells, some of which are producing. The acquisition includes properties that primarily are in the Midcontinent, Appalachia and Haynesville Shale. "In the current market environment, operators are focusing on their core assets more than ever before," Haymaker CEO Karl Brensike said. "I think everyone can agree that there is nothing more noncore to an operator than owning nonoperated royalty interests." FourPoint Energy, LLC announced today the signing of a definitive agreement to acquire all of Chesapeake Energy's remaining Western Anadarko Basin oil and gas assets for a purchase price of $385 million. The assets to be acquired include an interest in nearly 3,500 producing wells primarily in the Granite Wash, Missourian Wash, Upper and Lower Cleveland and Tonkawa formations. The production mix is approximately 67 percent natural gas and 33 percent oil and natural gas liquids. The assets cover approximately 473,000 net acres, within 15 counties in Western Oklahoma and the Texas Panhandle and are 98 percent held by production. The closing of the acquisition, which is expected to occur on April 29, 2016, is subject to customary conditions to closing. FourPoint will assume full operations of the assets at closing. George Solich, President and CEO of FourPoint said, "This acquisition will significantly increase our position in the Western AnadarkoBasin and will give us greater operatorship and capital control. The properties to be acquired create visibility into decades of development growth and closely overlap FourPoint's current acreage footprint. By optimizing our position we enhance optionality in drilling inventory allowing us to target the best upside locations that achieve the most economic rates of return." Gastar Exploration Inc. said Monday that it would sell its Marcellus and Utica shale assets to an affiliate of privately held investment developer Tug Hill Inc. for $80 million and exit the Appalachian Basin in favor of its Midcontinent assets. The company added, however, that it would mostly suspend exploratory drilling there until 2017 on low oil and gas prices. The sale would include Gastar's producing assets and proved reserves across 19,600 net acres in Marshall and Wetzel counties, WV. Financial analysts had expected the assets to bring Gastar nearly $100 million when the company announced that it would seek a buyer for the properties last October (see Shale Daily, Oct. 15, 2015). But the commodities downturn has complicated the market for acquisitions and divestitures. In announcing the deal, Gastar made clear that it needed the money. The company has been hammered by widening Appalachian basis differentials, which forced it to idle its operations in West Virginia last year and turn to oilier assets in the Midcontinent, where it has been earning higher returns (see Shale Daily, Nov. 9, 2015). Windsor High School junior Kamille Hocking worried a dozen oil wells on her family’s 132-acre Colorado homestead might sicken them. Then, Rebecca Johnson, an Anadarko Petroleum Corp. engineer, used a blender in her chemistry class to show the interaction of swirling frack sand, city water and friction reducer. Facing 10 possible ballot initiatives restricting fracking, Anadarko has deployed 160 landmen, geologists and engineers such as Johnson to Rotary clubs, high schools and mothers groups. They demonstrate how drilling works and try to convince people that the technique and the accompanying chemicals and geological effects don’t harm the environment or public health. These de facto ambassadors are proving effective in deflecting the effort by Colorado municipalities to gain greater control over drilling. They have been so successful that the Woodlands, Texas-based company also trained 2,000 additional employees in Colorado, Wyoming, Utah and Texas to answer questions posed to them by community members. The Coloradans use a smartphone app that supplies basic fracking facts. Others elsewhere get colorful printed materials. The Sierra Club weighed into the controversy over fracking and increased earthquake risk with a lawsuit accusing a Chesapeake Energy Corp. unit, Devon Energy Production Co. and New Dominion LLC of triggering tremors in Oklahoma and Kansas. The environmental group said the companies’ practice of injecting liquid oil and gas waste into deep ground-wells contributed to a spike of more than 5,800 earthquakes in Oklahoma in 2015, up from an annual high of 167 in the years from 1977 to 2009, according to the complaint filed Tuesday in federal court in Oklahoma City. The lawsuit, which follows more than 20 others since 2011 making similar allegations, comes after a 5.1 magnitude quake shook the region Saturday. The companies “have contributed and continue to contribute to the increased seismicity triggered by the waste handling, transport, and disposal activities at the injection wells owned or operated by the defendants throughout the state of Oklahoma and southern Kansas,” according to the complaint. Devon declined to comment on the complaint and officials at Chesapeake Operating and New Dominion couldn’t immediately be reached for comment. David J. Chernicky, chairman and founder of New Dominion, said the evidence tying underground wells to earthquakes is unreliable in an interview last year with Bloomberg Businessweek and expressed confidence New Dominion would prevail against an earlier lawsuit. Free cash flow for the fourth quarter of 2015 was ($33.5) million, compared to $42.9 million for the third quarter of 2015 and ($30.9) million for the fourth quarter of 2014. Free cash flow for the 2015 full year was $78.4 million, compared to ($192.3) million for the 2014 full year. Adjusted net loss for the fourth quarter of 2015 was $32.2 million or $0.64 per fully diluted share, compared to $47.6 million or $0.93 per fully diluted share for the third quarter of 2015 and $7.4 million or $0.16 per fully diluted share for the fourth quarter of 2014. Adjusted net loss for the 2015 full year was $155.4 million, or $3.11 per fully diluted share. Adjusted net income for the 2014 full year was $16.2 million, or $0.34 per fully diluted share. Net loss for the fourth quarter of 2015 was $60.6 million, or $1.18 per fully diluted share, compared to net loss of $48.5 million, or $0.95 per fully diluted share, for the third quarter of 2015 and net loss of $9.4 million, or $0.20 per fully diluted share, for the fourth quarter of 2014. Net loss for the 2015 full year was $221.4 million, or $4.42 per fully diluted share, compared to net loss of $8.0 million, or $0.17 per fully diluted share, for the 2014 full year. Adjusted revenues, adjusted EBITDA, free cash flow, adjusted net loss and adjusted net income are non-GAAP financial measures. Reconciliations of these measures to comparable financial measures calculated in accordance with generally accepted accounting principles (GAAP) are provided on pages 8 - 14 of this release. 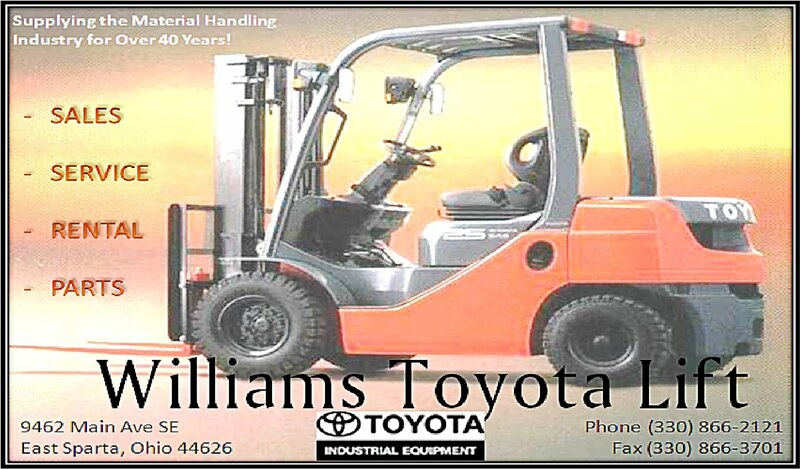 Williams Partners reported unaudited fourth quarter 2015 net loss attributable to controlling interests of $1.605 billion compared with net income of $382 million in fourth quarter 2014. The unfavorable change was driven primarily by a $1.1 billion non-cash impairment of goodwill and $859 million of non-cash impairments associated with certain equity-method investments. The impairments were largely the result of significant declines in energy commodity prices as well as market values of Williams Partners’ and comparable midstream companies’ publicly traded equity securities in the fourth quarter. The impaired equity-method investments and certain of the impaired goodwill relate to the acquisition of Access Midstream Partners completed in 2014. The remaining impaired goodwill was associated with 2012 acquisitions. For the year, Williams Partners reported unaudited net loss attributable to controlling interests of $1.410 billion, compared with net income of $1.188 billion for 2014. The unfavorable change was driven by a $1.1 billion non-cash impairment of goodwill and $1.3 billion of impairments associated with certain equity-method investments, as well as declines in NGL margins and higher operating, depreciation and interest expenses. Higher fee-based revenues and increased olefins margins partially offset these unfavorable changes. Read the whole report from Williams Partners by clicking here. 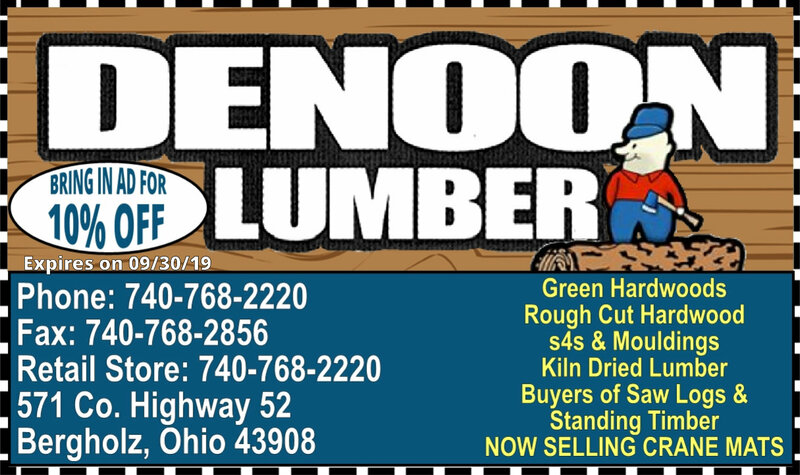 See the latest weekly permitting update from the ODNR below or by clicking here. Aggregate non-cash unrealized hedge gain of $24.8 million. Aggregate loss of $845.6 million in connection with the impairment of oil and gas properties. Aggregate gain of $10.0 million attributable to net insurance proceeds in connection with a 2014 legacy environmental litigation settlement. Aggregate loss of $43.6 million in connection with the impairment associated with Gulfport’s equity interest in Grizzly Oil Sands. Aggregate loss of $5.5 million in connection with Gulfport's equity interests in certain equity investments. Associated adjusted taxable benefit of $7.0 million. Adjusted oil and natural gas revenues of $165.4 million. Adjusted net loss of $609,000, or $0.01 per diluted share. Adjusted EBITDA of $95.2 million. Aggregate non-cash unrealized hedge gain of $83.7 million. Aggregate loss of $1.4 billion in connection with the impairment of oil and gas properties. Aggregate loss of $101.6 million in connection with the impairment associated with Gulfport’s equity interest in Grizzly Oil Sands. Aggregate loss of $4.5 million in connection with Gulfport's equity interests in certain equity investments. Associated adjusted taxable benefit of $11.8 million. Antero's initial capital budget for 2016 includes $1.3 billion for drilling and completion and $100 million for core leasehold acreage acquisitions and extensions. Antero's 2016 capital budget excludes Antero Midstream's(NYSE: AM) $435 million capital budget relating to low and high pressure gathering pipelines, compressor stations, fresh water pipelines and advanced wastewater treatment infrastructure. Antero Midstreamannounced its 2016 capital budget and guidance today in a separate news release, which can be found at www.anteromidstream.com. The $1.3 billion drilling and completion budget represents a 21% reduction in drilling and completion capital as compared to 2015. The budget decrease is primarily driven by continuing capital efficiency improvements, a reduction in rig count and the deferral and carryover of a total of 70 Marcellus and Ohio Utica well completions into 2017. Twenty of the deferred completions are Marcellus wells located on Antero acreage in West Virginia that are dedicated to a third-party midstream provider that were carried over from 2015 and will now be carried over into 2017. Approximately 75% of the drilling and completion budget for 2016 is allocated to the Marcellus Shale and the remaining 25% is allocated to the Ohio Utica Shale. Antero plans to operate an average of five drilling rigs in the Marcellus Shale in West Virginia and two drilling rigs in the Utica Shale in Ohio. In the Marcellus, Antero has budgeted the completion of 21 wells in its Highly-Rich Gas / Condensate regime and 59 wells in its Highly-Rich Gas regime, or a total of 80 wells. In the Ohio Utica, Antero has budgeted the completion of 11 wells in itsHighly-Rich Gas regime and 19 wells in its Rich Gas regime, or a total of 30 wells. The relative shift in activity in 2016 from the Ohio Utica to the Marcellus is primarily driven by firm transportation constraints in the Ohio Utica, as the Company projects utilizing all of its 600,000 MMBtu/d of Rockies Express capacity during the year. Beyond Antero's Rockies Express capacity to Chicago, the Company's next available outlet would be Tetco M2, a current unfavorably priced index, until the Rover Pipeline project is completed. For this reason, Antero plans to shift some activity from the Ohio Utica to the Marcellus Shale in 2016. The Company will gain an additional 800,000 MMBtu/d of takeaway capacity from the Ohio Utica upon the completion of the Rover Pipeline, which is now anticipated to be placed into service in mid-2017. The Rover Pipeline will enable Antero to transport incremental Ohio Utica gas production in the second half of 2017 and beyond to the favorably priced Chicagoand Gulf Coast markets. Antero entered 2016 running 10 drilling rigs, but is forecasting a step down throughout the year to average a total of seven rigs for the year. As six drilling contracts expire over the course of the year, Antero has the flexibility to reduce its 2016 capital budget further should market conditions deteriorate. FTS International, the well-completion company that recently laid off workers at its two Washington County sites, is in the process of selling its sand-hauling assets to a third party. The decision is mentioned in an internal memo from the company’s chief executive officer that was provided to the Observer-Reporter. On Friday, the Fort Worth, Texas-based company, which is the largest private oil and gas well completion service in North America, laid off an undisclosed number of people at its sand-hauling site in Venetia and others at its larger operations complex near Eighty Four. While not providing the number of people who were let go, the company acknowledged in an e-mail Monday it was “adjusting headcount” in response to lower customer demand. 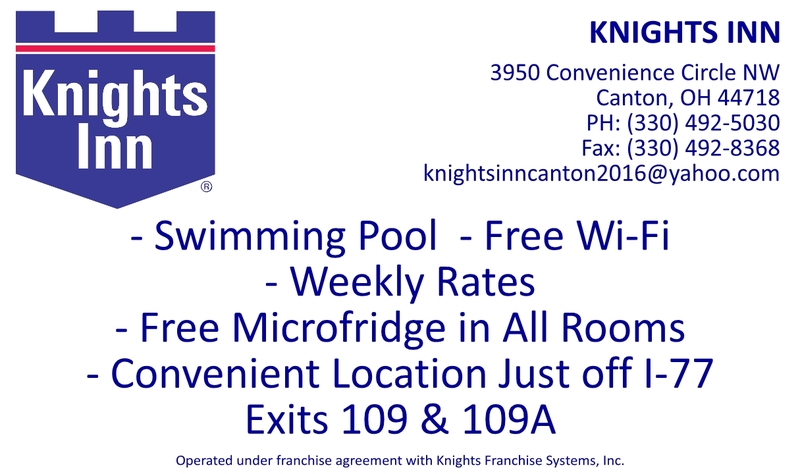 The company said it was not closing its Venetia or Eighty Four facilities. A former employee, who asked to remain anonymous, said later Monday, FTSI laid off 34 sand-truck drivers and seven “coordinators” at Venetia Friday. With capital markets tightening and oil still below $30 a barrel in spite of the deal announced between Qatar, Russia, Saudi Arabia and Venezuela today to freeze oil output at current levels, a growing number of increasingly distressed oil and gas companies are fully drawing the remaining availability of their outstanding revolving credit facilities – often in the hundreds of millions of dollars – to provide themselves with options in an impending financial restructuring. “The companies are making these drawdowns now, everyone realizing that cash is king and possession is nine-tenths of the law, and it’s better to have cash in the bank in place and extend that runway than not,” says Becky Roof, a managing director at the global consulting firm AlixPartners. This month alone Chaparral Energy, Midstates Petroleum and LINN Energy – three oil and gas companies with operations largely in the South Central U.S. – have drawn down the remaining amounts on their revolving credit facilities. 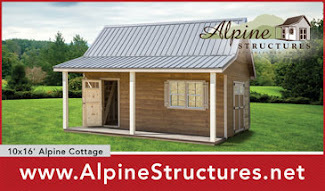 Midstates and LINN have publicly traded equities at pennies, Midstates at $0.18 trading under the MPOY ticker having moved down to the OTC Pink Sheets recently, and LINN under the LINE ticker on the Nasdaq at $0.38 both as of 1:38 p.m. EST. In a situation that has already resulted in bankruptcy, offshore drilling company Paragon Shipping, which drew down the remaining balance on its revolver in September, filed for bankruptcy on Sunday without debtor-in-possession, or DIP, financing, which is usually required if a largely insolvent corporation is going to restructure in court. “One reason to do it is to have free DIP financing,” says Damian Schaible, a partner in Davis Polk’s insolvency and restructuring group. Land acquisition for a new liquids-only pipeline across northern Ohio is proceeding with little uproar from neighbors. The $500 million Utopia East Pipeline has generated little community opposition, unlike two bigger natural gas pipelines that will also cross northern Ohio. It will run 210 to 215 miles through 14 counties from Harrison County in Ohio’s Utica Shale area west to Fulton County near Toledo where it would connect with an existing pipeline. It would pass through parts of southern Stark and Wayne counties. The pipeline, 12 inches is diameter, will ship about 50,000 barrels of liquids per day, said Allen Fore, a vice president for public affairs with Texas-based Kinder Morgan, the pipeline giant behind the new project. The capacity could be boosted to 75,000 barrels per day with the addition of two more pump stations. Two pump stations are planned. Construction would likely take place in 2017 and the line could begin services in late 2017 or early 2018, he said. The U.S. EPA recently requested funding to study the effects of hydraulic fracturing on air quality, but oil and gas industry advocates promptly dismissed the proposal as unnecessary. In its budget request for the 2017 fiscal year, the EPA proposed a nearly $1.5 million funding increase for its Air, Climate and Energy research program, which would "undertake a coordinated effort to study the potential effects of hydraulic fracturing on air quality." The study would be in keeping with a memorandum of agreement signed by the EPA, U.S. Department of Energy and U.S. Department of the Interior, according to the budget justification. "This research strategy is designed to evaluate the potential impacts of hydraulic fracturing on air quality to support sustainable approaches to unconventional oil and natural gas development and production," the agency said. Not surprisingly, the proposal drew exasperation from industry advocates, especially those in states with large oil and gas production. Kathleen Sgamma, the Western Energy Alliance's vice president of government and public affairs, told S&P Global Market Intelligence that the study was a sign that the Obama administration had put the cart ahead of the horse. With more than $150 billion in debt on their balance sheets, nearly 35 percent of pure-play exploration and production companies (E&P) listed worldwide, or about 175 companies, are at high-risk of slipping into bankruptcy in 2016, according to a new Deloitte study, "The Crude Downturn for E&Ps: One Situation, Diverse Responses." The outlook is almost equally alarming for about 160 other E&Ps that are less leveraged but cash flow constrained. "2016 will be the year of hard decisions. We could see E&P bankruptcies surpass Great Recession levels as companies struggle to remain solvent," said John England, vice chairman and U.S. oil and gas sector leader, Deloitte LLP. "Access to capital markets, bankers' support and derivatives protection, which helped smooth an otherwise rocky road for the industry in 2015, are fast waning. A looming capital crunch and heightened cash flow volatility suggest that 2016 will be a period of tough, new financial choices for the industry." Seeing the cash crunch, E&Ps worldwide have saved or raised cash to the tune of $130 billion, since the oil price crash. Surprisingly, two-thirds of the savings have come from non-capex measures such as asset sales and equity issuance. However, considering further equity issuance and asset sales will come at much lower prices, the report notes that E&Ps worldwide are entering 2016 with the only option of cutting their already reduced dividends and share buybacks. "Considering the industry will have fewer financial levers to pull in 2016, operational performance will be the key to sustainability and growth," said England. "There is still more that can be done by oil players, particularly large ones, to reduce costs. Prices will eventually rebound and companies need to focus not only how to survive, but also how to position themselves to thrive for when things turnaround and demand picks up." One of the key ways companies have managed to remain viable has been through the reduction of production costs, starting in 2015. Today, about 95 percent of production costs (lease operating expenses and production taxes) of U.S.-origin players operate below$15/boe, versus 65 percent in 2Q14. The report states that questions on current breakeven prices and near-term cash flows should give way to the future return on capital employed (ROCE) potential of the industry. As the industry improves performance on costs/efficiency, its future emphasis will not be about its ability to make profits at low prices, but generating sufficient ROCE on a large base of devalued investments made in the past. Further, economies of scale and scope appear to be benefitting natural gas players more, reflected in the widening gap between large and small gas-heavy companies and marginal cost differentiation between large and small oil-heavy players. That noted, spending cuts in 2015 and 2016 – the first time since the mid-1980s that industry will reduce capex for two consecutive years – will likely have a substantial and long-lasting impact on future supplies and open new chapters in the geopolitics of oil. E&Ps risk slowing the conversion of resources to reserves in frontier locations and the capex required to maintain aging fields and facilities, the report warns. The report further anticipates that future M&A activity will most likely go beyond the typical buying reasons of the past–preference for oil-heavy assets and buying for growth/scale. Companies that prioritize returns over size, have a balanced and flexible production profile over a deep inventory of non-producing asserts, and give thought to economies of scope over economies of scale will most likely thrive when the price environment improves. "There is no silver bullet solution that applies to the whole industry; in fact, the landscape has never been more complicated," concludedAndrew Slaughter, executive director, Deloitte Center for Energy Solutions. "Each company has its own set of unique factors to consider – from issues specific to each producing region and asset, to various states of financial circumstances. Staying solvent will require the same level of perseverance, innovative thinking and creativity as the technology breakthroughs that led to the boom in supply we have seen over recent years." Shell has a deal in place to build a new office in the onetime headquarters of Michael Baker International in New Brighton, Beaver County, sources told the Business Times. The 76,000-square-foot building is close to the Potter Township site where Shell continues to consider a new ethane cracker plant. Shell did not confirm the decision. “For confidentiality reasons, we do not comment on the status of current or potential commercial arrangements,” a Shell spokeswoman said Wednesday. Kurt Bergman, president and CEO of Michael Baker International, and a spokesman both deferred questions to Shell. 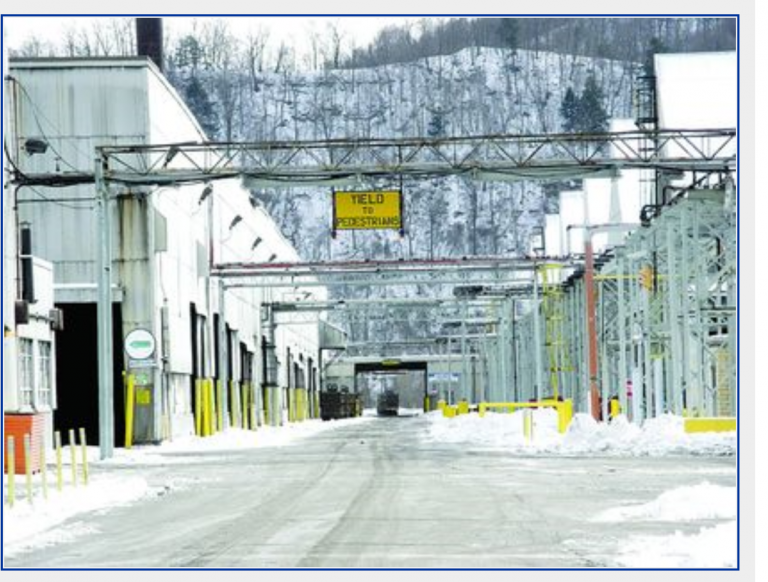 At a time when these sorts of projects are more up-in-the-air than ever, this is an interesting indicator that the cracker plant in Beaver County is a strong possibility. NEW YORK, NY (2/11/2016) – While the naysayers preach oil’s decline and overestimate the viability of alternative energies, American shale oil companies—after radically and rapidly repositioning the country in global oil markets and boosting economic recovery—have been largely neglected. A new paper by Manhattan Institute Senior Fellow Mark Mills illustrates the increased importance of oil to the global economy and outlines steps Congress can pursue to ensure the international competitiveness of America’s shale industry and reshape a volatile geopolitical order. Mills argues that low oil prices aren’t a sign of oil’s decline, but of the need to implement policy reforms that allow more domestic shale growth. If we can replicate the growth in shale production seen over the past decade, Mills predicts the economy will benefit from a second shale boom, and the geopolitical status quo will shift dramatically in America’s favor. Community Action of Wayne and Medina counties received a donation Wednesday from Kinder Morgan, developer of the Utopia East Pipeline Project, toward its new expansion at Lincoln Way Center, 905 Pittsburgh Avenue, Wooster, and core services, including Head Start, safety programs, parents’ support groups, housing, economic assistance programs, and more. Allen Fore, vice president of public affairs for Kinder Morgan, presented a check for $5,000 to Melissa Pearce, president and CEO, at the Community Action Wayne/Medina facility. “Thanks to this generous investment, we can reach more low income residents in the communities we serve,” said Pearce. Fore, along with other Kinder Morgan representatives, toured the facility and interacted with the children that benefit from the organization’s Preschool Head Start program. Just two years ago, the Appalachian region in Ohio suffered one of the most devastating job losses of 2013: the Ormet aluminum smelting plant in Monroe County, located along the Ohio River closed, leaving 1,000 people out of work in Ohio and West Virginia. If the job losses weren’t bad enough, the closure also meant that millions in tax revenues would also be lost. But then along came the development of Ohio’s Utica Shale. 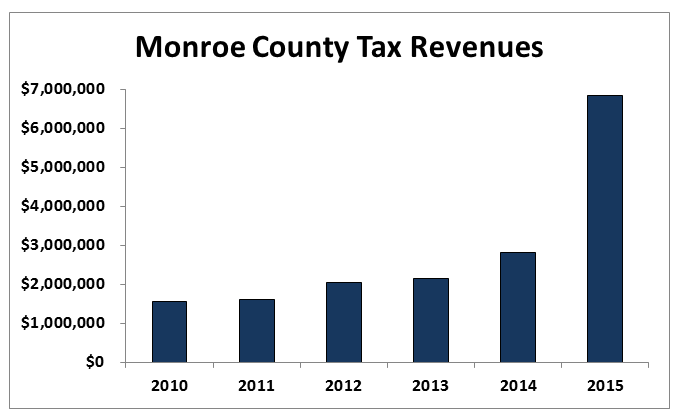 Thanks to natural gas development in the area, Monroe County has had an over 340 percent increase in tax revenue, which has not only filled the void left by the plant closure, but has also brought back hope to the community that had been shattered two years ago. Today, natural gas development has been said to be the “lifeline” for Monroe County. Tax revenues increased from $1.5 million in FY2010 to a whopping $6.8 million in FY2015. The tax loss from Ormet, during the same period of time, would have created a $4.5 million deficit from the county budget. Instead, the oil and natural gas industry not only covered that loss but added supplementary millions, as is evident by the county sales tax records. Unless you live and work in Ohio, it’s hard to imagine the positive transformational change that has occurred in many of the state’s poorest counties. Reports cited international trade regulations as the cause for the closure of the Ormet plant, which resulted in 1,000 local jobs going over to China. Monroe County was a poster child of shipping jobs overseas. Mr. Jackson may have been correct back in 2013, but the county did not realize this prediction, thanks to shale development. In stark contrast, today, the industrial park which is only a few miles from the closed Ormet plant shows signs of life, with new business and corporate offices. 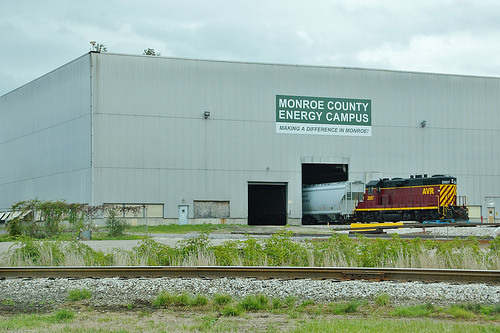 The industrial park was even renamed “Monroe County’s Energy Campus” and has received high honors from the Eastern Ohio Development Alliance (EODA) as the emerging area to conduct business in the region. With a flurry of new pipelines, staggering production of natural gas, and access to road, rail, and barge, Clarington, Ohio (located in the Monroe County) is on pace to set the standard for natural gas prices. 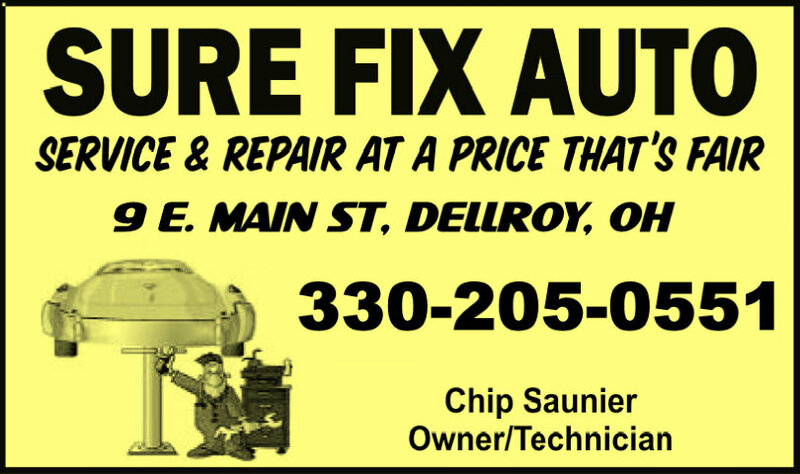 Indeed, Clarington may in fact become the new Henry Hub within the next few years. Take a look at what the industrial park looks like today and what local folks are saying about the emerging natural gas industry, which is bringing this county back to life. 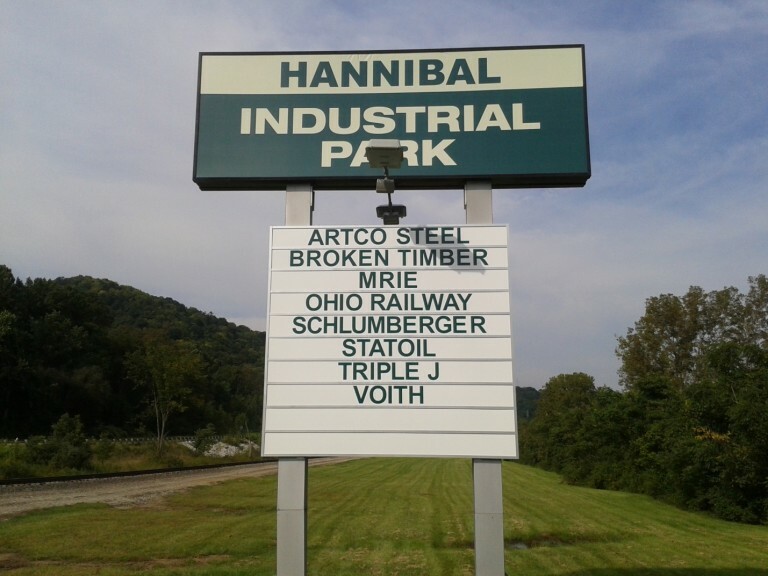 Recent photos of the Hannibal Industrial Park, located in Monroe County, and its tenants. These tenants support the county through various income and sales tax revenues. As EID continues to highlight, out-of-state and foreign anti-fracking groups often try to completely misrepresent the true impact of shale development to local communities, like Monroe County. 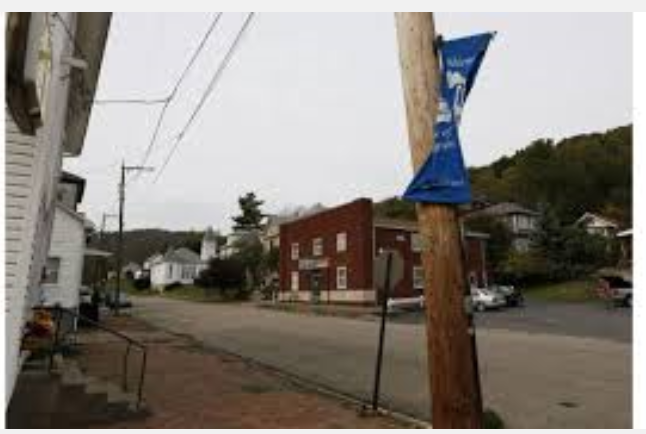 The fact is, this Ohio county has been completely bailed out because of the oil and natural gas industry. With staggering natural gas production, it’s safe to say that this good news will only continue to be “pretty amazing”.